Failed professional gambler Jim Merriman goes to Florida to attend his sister’s funeral and ends up saddled with her loser son Leon, who is in debt to a vicious loan shark who sends a pair of sociopathic thugs to collect the money. Just when it seems things couldn’t get any worse for Jim and Leon, they get sucked into a kidnapping plot involving the sexpot wife of a rich businessman, a fake preacher selling mail-order tombstones, a psychic who channels the dead, and a sleazy PI that spirals as dangerously out-of-control as the hurricane that’s closing in on the Treasure Coast. Treasure Coast offers 358 pages of dark humor, gritty storytelling, sharply drawn characters and shocking twists...Kakonis's new book is a smooth-tongued narrative that lures you in with its tight descriptions and dialogue that quips with authenticity if not honesty, building to its "hurricane" of a climax. Dark humor prevails in this tale of damaged souls who are flawed, yet desire something meaningful in their lives. 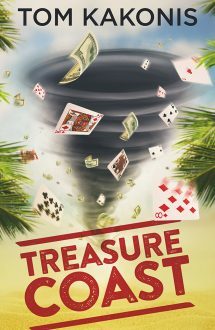 Treasure Coast is fast, funny, black, violent, irreverent and politically incorrect. Overall verdict: really enjoyable.